SAP BPC 10.0 allows you to get data from source systems in to an Excel interface. It allows you to analyze the multidimensional data and BPC 10.0 provides number of inbuilt templates that can be used for analyzing and you can also add different formulas to design reports. SAP BPC 10.0 provides various exceptional capabilities including integration with SAP HANA over BPC 7.x to handle big data environment for reporting purpose. SAP BPC also provides use of input schedules that allow you to send the data from report to database. Input schedules provide you with all the functionalities as that are available in BPC reports. The difference between Report and Input Schedules is that reports are used for analyzing data and input schedules are used to write data to database. You can opt from the following methods to create reports and input schedules in Business Planning and consolidation tool. To create reports in EPM Add-In Interface for Excel, you have to enable the following option. 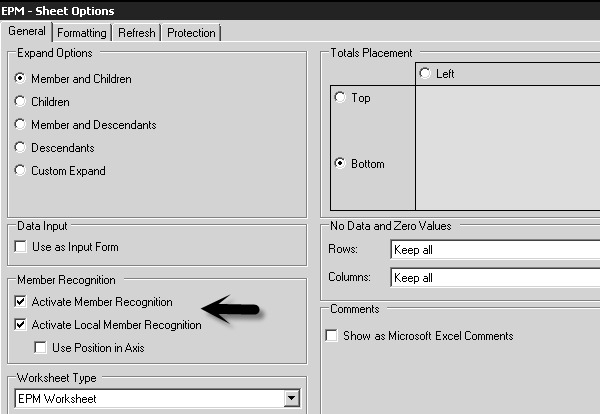 Go to EPM → Options → Sheet Options → Check the box ‘Activate Member Recognition’. You can simply drag the dimensions and drop it to excel sheets. It is the easiest method and displays the report based on dimension selected from the list of available dimensions. Other option to create report using Excel Add-in is by adding dimensions to Row axis and Column axis. Once you add the dimensions click ‘Update’. 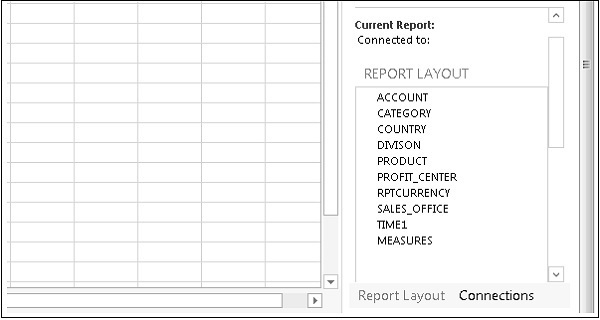 You can also create reports by simply typing dimension member in the report area. BPC Excel add-in identifies the member and display result. It supports MS Office 32 bits. It degrades the performance if you are querying using ODBO connection. It runs on .net 3.5 framework. It doesn’t support big volume BV mode. It supports MS Office both 32 and 64 bits. It supports BV mode on BW data sources. It provides performance optimization if you are querying using ODBO connection. It also support *.msp file (have to uninstall/re-install). It supports BW connections for embedded model. There are various templates in sample app set and you can select any of these and customize them to meet the report requirement. Using this feature, it allows you to save report locally or on the server. When you modify an existing report you can also save it as template for future use. BPC administrator can only have rights to save customized report as template on the server but you can save them locally. Subtotals by Account This custom report contains Account dimension with subtotals in rows and any dimension across in columns. Variance This custom report contains any dimension in rows and categories comparison in columns. It also features variances calculation (both amount and percentage). With both YTD and Periodic boxes. Consolidating This custom report contains any dimension in rows and Entity type members across in columns with hierarchy. Comparative X This custom report contains any dimension in rows and categories comparison in columns and also retrieves the last year same period data. With both YTD and Periodic boxes. Comparison with 3 -year Year over Year comparison. Drill in Place This template performs drill in place. Nested This allows any two dimensions to be nested in a row and a third dimension in column. Sort on value This template performs the sort on total value. Drill Dimension This allows to use drill in one dimension to other. 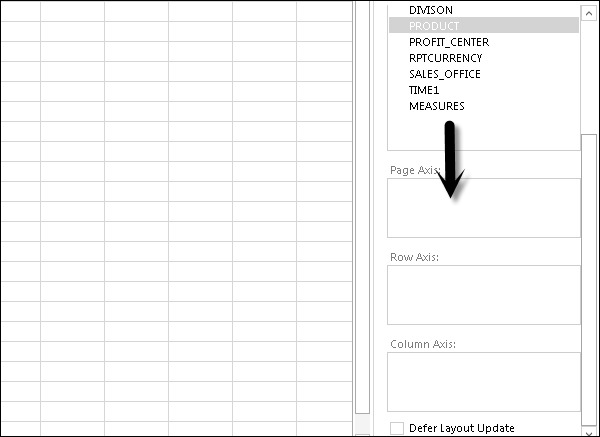 Launch EPM Office Excel Add-in, to use a template. These templates are available in Company folder and they are created using BPC add-in not like BPC 7.x where templates are created using EvDRE. There are three ways to create a report in BPC. You can create simple reports using EPM action pane by dragging dimensions and dropping it to the report area. You can add dimensions to direct axis as shown in the following screenshot. Similarly, you can create ad-hoc reports using the action pane. All reports that have been created in BPC 7.5 Excel can be migrated to BPC 10.0 using EPM Excel Add-in. EvDRE migration feature in Add-in is used to migrate as many features as possible to new version but the customized reports and templates can only be partially migrated and requires some manual effort for full migration. Open the reports created in EvDRE. Update the report to have correct Dimensions migrated. Next go to EPM Ribbon → More → EvDRE Migration. When you login to BPC web client, first screen that opens is start page and home tab. Go to New Report and the following screen will open. From the dropdown menu, select a new report, input form. On the right side, you have the list of available dimensions. 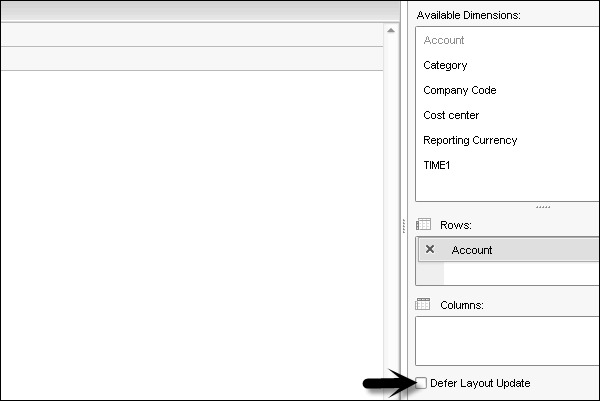 You can add dimension to Row and Columns as per requirement. You can also edit the existing reports. There is an option to defer report layout. If you select this option it won’t change the report layout.